Hypertufa troughs are an earthy and natural container that goes with every garden style. Modeled after ancient stone troughs that were once used to hold water and feed for livestock in England and the Orient; later they were repurposed into planters. The look of these troughs as containers became very popular. When there weren’t enough to go around, or as they became too pricey, people began to make their own. A worthy container in their own right, hypertufa troughs should not be considered a poor substitute to the real thing—they are the perfect planter and will provide many years of good-looking service. 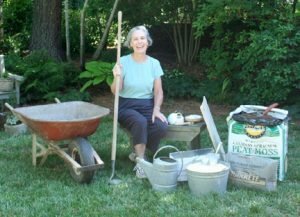 Beth Jimenez and Amelia Lane of Lasting Impressions in Raleigh share their recipe for making a hypertufa trough. Once you learn how easy they are to make, you’ll want to make a grouping of several containers. • One sheet of 2-inch-thick foam insulation board cut into two pieces 16×6-inches and two pieces 18×6-inches. Using the serrated knife, cut insulation into two 16×6-inch pieces and two 18×6-inch pieces. Assemble these four sections into a square or rectangle, depending on how you join the ends. Insert two nails through the insulation material–one near the top and one near the bottom–of each intersection. Wrap tape around the mold to cover the nails, once near the top and once near the bottom, for added reinforcement. Mark a line two inches from the bottom as a guide to the depth of the hypertufa; this will mark the thickness of the bottom of your trough. Put on your mask and gloves and measure two gallons cement, two gallons perlite and four gallons peat moss. The amount will allow for some left over material to make trough feet. Mix the dry ingredients in your wheelbarrow with the hoe. Add one-third cup of reinforced concrete fibers to give your hypertufa trough more strength. These can be found at a concrete building supply store or through Lasting Impressions’ website. Slowly add water to the wheelbarrow. Start with about three gallons and mix it well with the dry materials. You should end up with a consistency like cookie dough or a graham cracker crust. It should be wet enough to adhere so it doesn’t crumble, but not too wet to ooze water. Set the mold on the plywood board. Begin packing the bottom with the hypertufa mixture, using your previously marked line as a stopping point. Working a small area at a time, use your hands to firmly press the mixture into the bottom corners and up the sides, making sure to mash one section into another for seamless adhesion for a strong trough. Continue until the sides are covered by a 2-inch-thick layer. Spray water as needed to keep the mixture moist while you are working. To aid in proper drainage, use a dowel to poke holes in the bottom of the trough. Insert the dowel through the hypertufa until it meets the plywood base. Repeat to make six evenly spaced holes. Leave the trough to dry in a protected area. Your trough should dry in about 24 hours. After it’s dried and heather hard, carefully remove the tape and nails and pull the sides of the mold away from the trough. The tough can be used as is, or, if you prefer a textured, aged look for your trough, gently score the exterior with a wire brush or screwdriver taking care to not poke holes in the sides as you work. Store the trough in a shady area to cure for 28 days. The hypertufa trough gets stronger every day. Your container can be left out in freezing temperatures as long as it is off the ground. Use any leftover mixture to create feet for your troughs. These feet will keep your trough off the ground. Pot up your hypertufa trough with a selection of your favorite plants and enjoy for years to come. 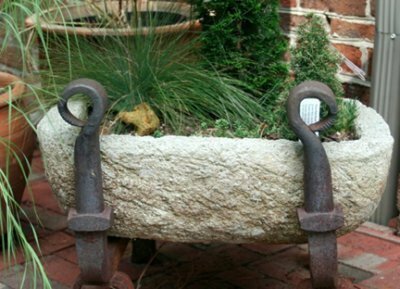 Place your hypertufa trough on porch steps, in a garden bed or border, or on the patio. It will work anywhere you choose. If you prefer to be instructed by experts, Beth and Amelia of Lasting Impressions offer classes to make hypertufa troughs, and they also have troughs ready for sale. Helen Yoest is the author of “Gardening with Confidence®–50 Ways to add style for personal creativity.” Helen is an award winning garden writer, garden coach and a sustainable gardener caring for her ½-acre wildlife habitat, Helen’s Haven, in Raleigh.